Giant Geometry: Public Art Project! I get told quite often that I am, "A creative and innovative person who is always making connections." Until the advent of our school's IDEA Lab, I felt pretty frustrated in that I rarely had a vehicle to explore those connections. This year, in my job as Teacher/Librarian/Maker/Technology Integrator/STEAM Educator, I have had the opportunity to make connections with my colleagues in ways that never could have happened before. For example, our fourth graders have enjoyed string art explorations for over a decade. My colleague, Judith Campbell, and I made it a tradition our students look forward to each spring. We begin by making curves out of straight lines on paper and end with nails on wood and a variety of brightly colored string. Well, this year I happened to see an image on Facebook from a fellow educator Amy Hartman. The image was a gigantic 'string art' project. The pink and green tape contrasted beautifully with the green grass below. As soon as I saw it I knew we had to do this with our students. Time was short, however, and we only had a week or so left of the year. We proposed the idea to our fourth-grade colleagues and they were thrilled! We created a 'morning math' problem for the students where they estimated how many feet of 'tape' we would need to create a design. I made a trip to one of my favorite hardware stores and purchased a couple of bundles of 24" stakes and two 150' rolls of pink, green, orange and yellow surveyor's tape. The total amount of materials was just under $50. When the morning of our exploration arrived, it was a gorgeous sunny day. We gathered all three fourth grade classes in our outdoor classroom, which conveniently is in the shape of a circle. As we reviewed the number of degrees in a circle and how to use a protractor, I showed them two large wooden boards that were bolted together in a way that resembled a giant angle. We did some quick mental math to figure out the angle that would be created from the center point to each of the stakes around the circle. We divided 360 degrees by the 31 stakes and came up with 11.6 degrees for each angle. We used the protractor to set this angle on the wooden boards and then added a cross piece to hold the angle in place. In retrospect, it would have been a lot easier had the actual boards been the same radius as the circle. As it was, our boards were only 8 foot long. So, we had to 'extend' them using orange masonry string. It worked, but next year we will use 12-foot boards. We broke the classes into two groups and rotated the students through in 20-minute rotations. We hammered a center stake and began working our way around the circle every 11.6 degrees. We double checked the accuracy by using a tape measure to ensure that the stakes were 12 feet away from the center point. Somewhere along the way, we got off a tiny bit. We ended up having to squeeze in two additional stakes to ensure that the number of stakes was an odd number. This is important because the odd number causes the unique visual patterns. We created a 'rotation' so that all students would get to take part in the process. One person hammered. Another held. There was a student at the center making sure the wooden protractor was at the center point and there were two students moving the actual wooden boards. When we had successfully placed the 33 stakes, we began by tieing off one of the surveyor's tape rolls at a starting point. We then had two students rotate through counting and wrapping the tape. The counter walked along the outside of the circle and counted the pattern. We began with 13. When we returned to the starting stake, we switched colors and began a new pattern, 11. All this time, we had one student stay in the center and verify that we were on the correct peg. This was critical because it was very easy to get out of synch, especially as we added new layers. Very quickly the students began to see the same patterns they had explored in their own projects come to life on a much larger scale. We learned a lot from our first experience and hope to do this project again. Next year, we will attempt three large installations rather than one. We'll also have students do the estimation work to help us purchase enough materials. Finally, we want the students to have time to reflect and share the process. This year we barely got it in before the last day of school! We also will try to integrate several other 'string art' experiences into this project earlier in the year. We tried to get some 'bird's eye' footage using one of our drones, but that footage was less than amazing. Next year we are going to ask the village to bring their bucket truck to help us get way up and take a few photos from above! I discovered a very cool string art app that will be a lot fascinating for our students to explore. 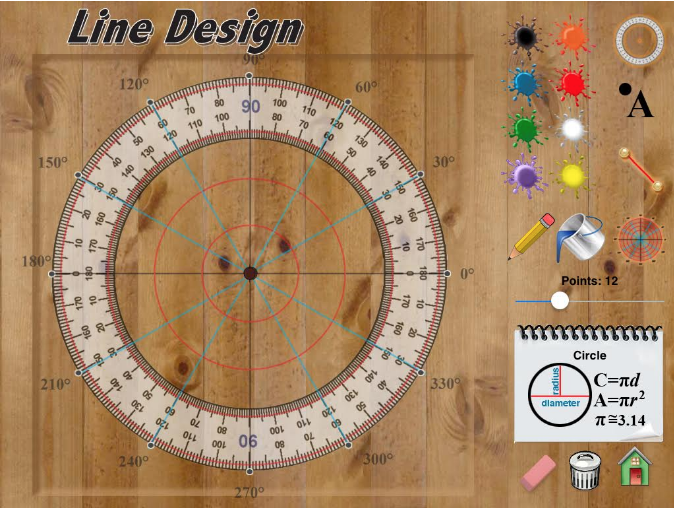 The app is called Hands-On Math Line Design by Ventura Educational Systems. 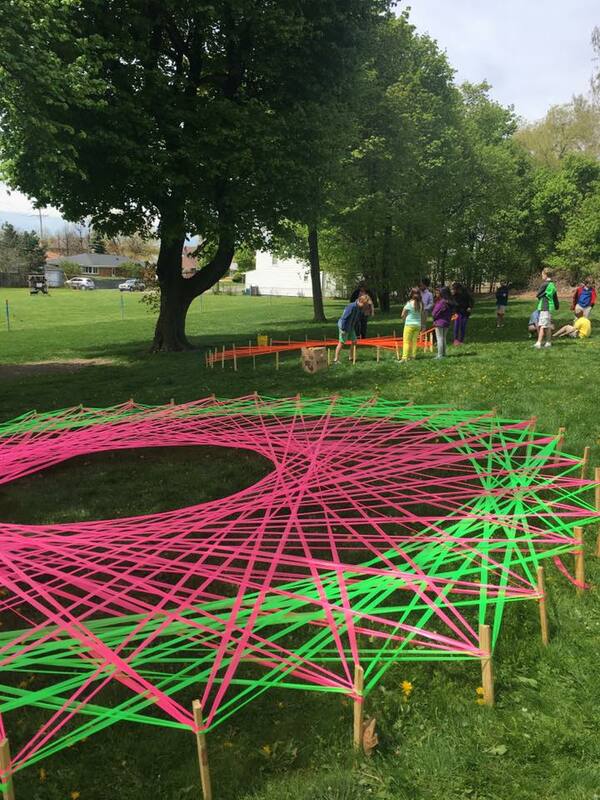 Fred Ventura, the designer of the app was incredibly excited to see our outdoor string art project. I sent him some feedback about the app and requested a couple of feature requests ( I was looking for a way to change the background from the woodgrain to a solid color and a way to save just the design). He made the changes and updated the app within a day! Unfortunately, I didn't learn about the app until after we completed our exploration, but next year's students will benefit from it significantly! 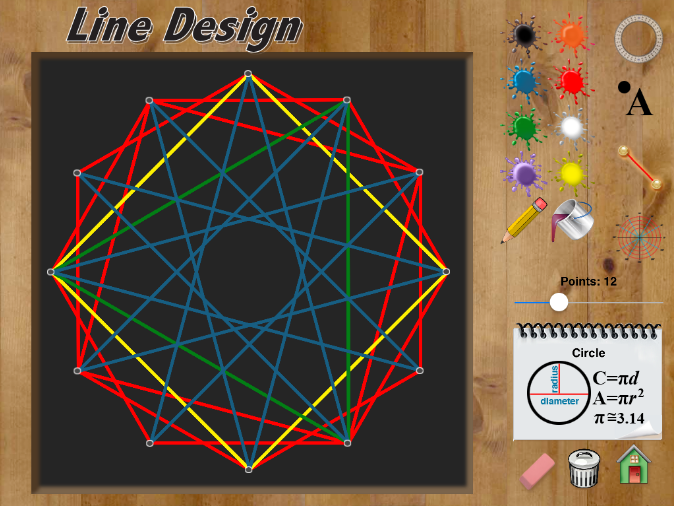 Additionally, I came across quite a few patterns and resources for doing string art with students on the web. The first is called String Art Fun. The site offers many free patterns and even a teacher's section with specific instructions for how to create both string art and doing the same mathematics, but with stitching rather than using nails. I downloaded all of the patterns and look forward to exploring them with students next year! 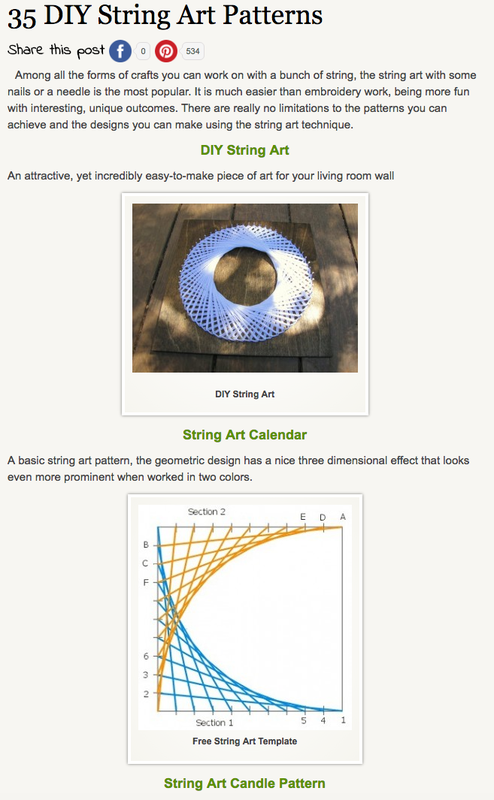 I found this site as well: http://www.guidepatterns.com/35-string-art-patterns.php It offers over 35 free string art patterns; some are quite intricate, while others would be perfect for even the youngest student. Pinterest as always is a gold mine. There are literally hundreds of phenomenal ideas there. I created a new board to collect my favorites. This project was the perfect blend of STEAM integration. I'm going to have a hard time waiting until spring to explore this with our student's!